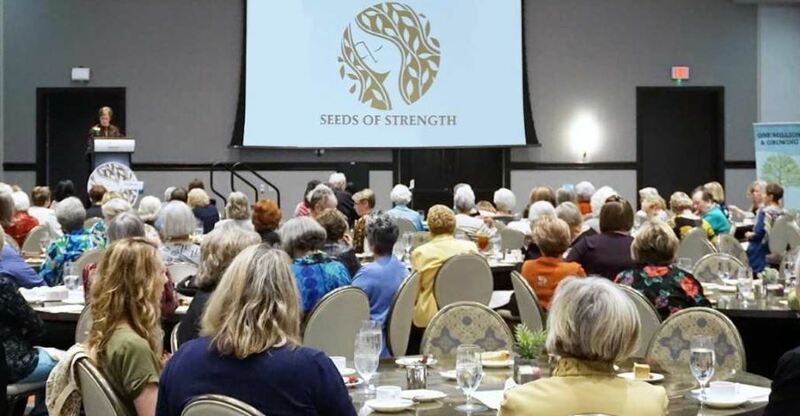 On Thursday, September 27, about 130 women came together at The Sheraton for the 10th Annual Seeds of Strength luncheon. Cindy Locke,” the outgoing Chair, welcomed a room-full of members, all “caring, giving women.” She expressed the honor she has felt to lead this dedicated group of women and an organization “operated on volunteer power!” across the Million Dollars Given Milestone, just one of many record-breaking events this year. Cindy acknowledged the contributions of the outgoing Guiding Circle members and thanked the Committee Chairs, all who helped make 2017-18 a banner year. With happy tears and a big smile, she passed the SoS gavel (a.k.a. the mighty SoS whistle) to incoming Chair Lexi Elliott. The new Board (formerly called the Guiding Circle) members and Committee Chairs were introduced. Lexi is especially excited about the incoming new members who will find their area of interest within SoS and join a Committee. There were several serendipitous moments that day. One was when The Georgetown Health Foundation presented SoS with a check for $5000.00, money that will be used to help cover our administrative expenses! Beautifully decorated tables set the tone for the delightful and tasty lunch, followed by a choice of cheesecake for dessert. And that was just the prelude to the highlight: keynote speaker Monica Maldonado Williams, founder and editor of GivingCity, Austin. She has over 20 years’ experience in marketing, communication, journalism, and new media. Ms. Williams delivered an insightful presentation based on her research into why people give of their money. She explained that the common denominator among people in deciding to give to various causes is being emotionally moved by a personal story. At SoS we know first-hand how important that is. On Voting Night, we have an opportunity to hear from the people of Georgetown who are vying for grants. No doubt these stories influence our vote. As the luncheon concluded, new Chair Lexi Elliott reminded us that SoS is poised to have yet another dynamic and fun year!